Rakotoarisoa J-E, Capparella AP. 2013. Forest-bird Species Assemblages in the Lowland Rainforest of Madagascar: The Effects of Forest Fragmentation Revisited. The Open Conservation Biology Journal 7:27-41. Abstract. Although the eastern lowland rainforest of Madagascar houses a high proportion of endemic birds, little is known about how fragmentation effects and habitat loss specifically impact them. We analyzed published lists of forest birds across several eastern lowland rainforest fragments of three size classes (large: ~ 6,000 ha, medium: ~ 2,000 ha, small: ~ 600 ha) and varying distance (0.45-20 km) from a nearby continuous forest block. Several key species traits were incorporated to elucidate 1) patterns of species loss across forest fragments and the characteristics of lost species; 2) relationships of species richness and composition with fragment size and distance, and the factors that potentially drive these associations; and 3) pattern of nestedness in the resulting species assemblages. At the scale of our study, we found that speciesâ€™ vulnerability to loss was a function of degree of rarity and ecological specialization, such as insectivorous diet and habitat restriction. Fragment size was associated with species richness and composition. However, distance from the remaining continuous forest block and human disturbance, such as selective logging, may also influence their patterns of association. Both ecological factors and sampling effects (passive sampling of the regional species pool) appeared to influence species distribution across our fragments. Although no significant pattern of nested subset was detected among individual fragments, such a pattern is apparent among fragments from the three size classes. We briefly address conservation implications of these findings. 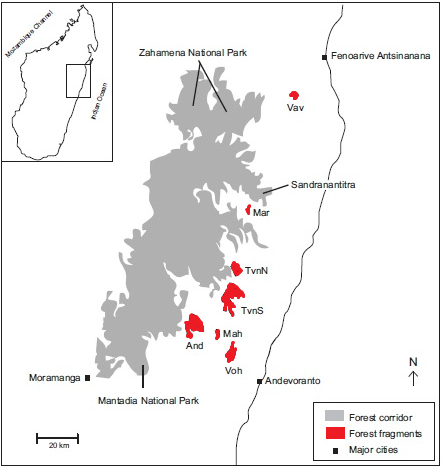 Species lists were obtained for 10 forest fragments in the Mantadia-Zahamena corridor in Madagascar. Two weaver species were recorded: the Forest Fody Foudia omissa in 6 of the 10 study sites and the Nelicourvi Weaver Ploceus nelicourvi in 9 of the 10 sites.